AGU2011: What Would Pristine Air Mean for the Climate? Imagine that all the aerosols (the miniscule particles of pollution, dust, sea salt, and many other things) floating around in the air over the United States suddenly disappeared. What would their absence mean for the climate? Loretta Mickley, a climatologist and aerosol expert from Harvard University, has tackled just that question by running a series of simulations with a high-resolution computer model developed at NASA’s Goddard Institute for Space Studies. Her conclusion: the elimination of the particles would increase ground temperatures across the eastern United States, cause more springtime rain to fall, and drive an uptick in heat waves. All of this would be driven by something scientists call the “direct effect” of aerosols – the particles’ ability to warm or cool the atmosphere by either absorbing or scattering incoming energy from the sun. (In this case, the model didn’t account for the “indirect effects” of aerosols – how the particles affect clouds, a detail that can have an impact on how they affect the climate as well). We find that removing U.S. aerosol significantly enhances the warming from greenhouse gases in a spatial pattern that strongly correlates with that of the aerosol. Warming is nearly negligible outside the United States, but annual mean surface temperatures increase by 0.4-0.6 K in the eastern United States. Temperatures during summer heat waves in the Northeast rise by as much as 1-2 K due to aerosol removal, driven in part by positive feedbacks involving soil moisture and low cloud cover. Reducing U.S. aerosol sources to achieve air quality objectives could thus have significant unintended regional warming consequences. 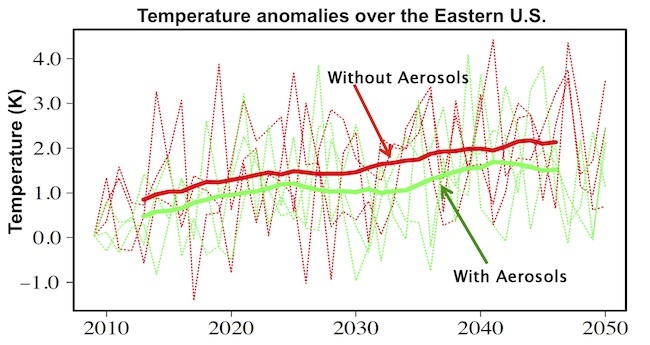 There’s good reason to consider how falling levels of aerosols will affect the climate. In the United States, several kinds of aerosol particles have actually seen their numbers fall steadily as regulations have gone into place to clean up the air for the sake of public health. Emissions of sulfur dioxide, for example, a gas produced by coal power plants that generates reflective sulfate particles has fallen by 83 percent since 1980. Mickley presented her poster on Monday, Dec. 5, 2011. Text by Adam Voiland. Aerosols panel (from left to right:ash, pollen, sea salt, soot) published originally by NASA’s Earth Observatory. Lowerfigure courtesy of Loretta Mickley. Previous Previous post: To What Degree is Extreme Weather Linked to Climate Change?